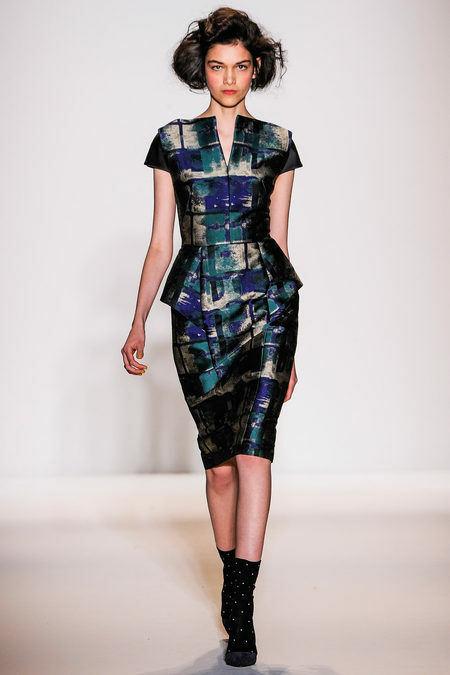 Lela Rose brings her sense of femininity and class to the runway with beautiful patterns and an array of colors. Peplum is becoming a staple on the scene and Rose does not tell us otherwise. The collection gives us a sense of youthful class, with hints of some sweet southern hospitality and influences from decades previous. Lela is throwing class and glamour at us and we are accepting. Donna Karan mashes together athleticism, masculinity and lots of subtle edge in DKNY’s Fall RTW. One thing that goes without a doubt is that long coats are very, very in. These looks are not for the meek, if the bold prints and bright colors don’t send away the faint of heart, the strong and bold tailoring will. Black is still the new black. Tracy Reese challenges an edgy, dark and yet still fun vibe for this season. 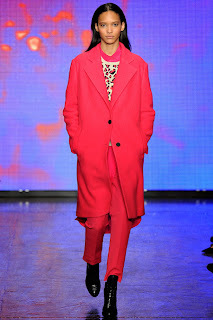 Subtle pops of color and print cover the runway without being overwhelming or taking away from the total design. Chic a-lines and short pants let you know this is not the look for the girl next door. Mixing prints and playing with colors are rampant in this line and going strong. Diane von Furstenberg sends her ladies to the runway in prints, prints, and more prints! The sophisticated line shows a use of plenty of different fabrics, showing off knowledge in what really makes a woman look good. The looks show off the figure without being too clingy and goes for classic instead of trendy. This is an exciting time for Prabal Gurung. Last weekend the Target collection launched and the fall 2013 collection presented today was incredible. From the first piece, it's easy to see there is a military inspiration present and it flows effortlessly throughout the rest of the collection. As we've see with other designers, leather is also a major component as well as layering. I'm really excited for this collection next Fall as I think it will set the bar for the military trend in ready-to-wear. Hands down, Carolina Herrera presented one of our favorite collections thus far. Her gorgeous gowns hinted at a vintage 1920's glam as we started to wonder which starlets would be wearing her dresses on the red carpet. The styling for each model was perfect from the makeup to hair and the colors she used were rich and sophisticated. What we love so much about this collection is the pop of color and unexpected details. Every outfit that came down the runway had something special that stood out; whether it was a pop of lime green or metallic. The use of textiles is also incredible. The mix of silk and wool within the collection as it added a nice amount of texture to each look. It was really exciting to see this collection because burgundy apparently will continue for fall 2013. I don't know how he does it, but Marc Jacobs always manages to combine youthful, contemporary, vintage and fun all together to create a polished and stylish look. His prints are always exciting and he always does an incredible job of styling the models so they are easily recognizable as one of his own.